Two couture tennis dresses by Lucien Lelong, January 1928. Imagine the background in green, and the coat on the right in tucked scarlet crepella. Wow. Lelong discusses color in the first part of this article on resort wear for America’s brighter sunlight. Delineator, top of page 32, January 1928. It’s a pity that the Delineator ran this article in black and white! Couturier Lucien Lelong explained to the Delineator magazine how his resort wear for Palm Beach differed from the colors he would have used for French clients. For evening he suggested lighter shades: greens, grays, coral, pink, amber, ivory, and black and white. Two evening gowns by Lelong, January 1928. Left, black with rhinestone bands; right, mauve pink chiffon. Left, Lelong uses “green jersey banded with darker green and worn under a sponge cloth coat of string beige.” Right, “blue and white printed crepe de Chine with chartreuse bands and beach coat.” Both have “tunic tops and shorts.” January, 1928. Left: Lelong’s blue two-piece sports frock with bands of graded colors. Right, a three piece ensemble in two shades of blue. January 1928 resort wear. Two sleeveless and collarless tennis frocks, plus a scarlet coat of tucked crepella. Lelong resort collection, January 1928. Delineator. Illustration by Muriel Lages. “Design grows more and more simple in appearance, tho [sic] inner cuts are complicated. And of course, all these models, as is usual with me, induce slenderness in the appearance of their wearers. That sums it up.”– Lucien Lelong on his resort collection, in Delineator, January 1928. When I called Lelong “extraordinary,” I wasn’t exaggerating. As head of the Chambre Syndicale de la Haute Couture during the German Occupation of Paris, Lelong managed to thwart the Germans’ plan to move the center of couture to Berlin. You can read “The Man Who Saved Paris” by clicking here. Further reading: The Encyclopedia of Fashion has a bibliography of books about Lelong. Click here. Clothes for girls (and a boy) age 15 and under, Delineator, July 1926, page 30. I’m making an educated guess at the age range, based on other Butterick illustrations. Teen girls aged 15 to 20 years were “Misses,” and they usually had their own pages of fashions in Delineator magazine. 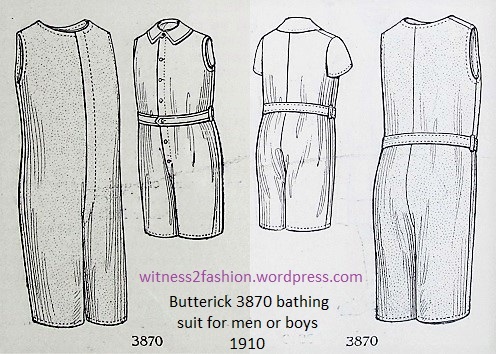 Butterick patterns for children often reflected adult style details; but styles for young children changed very slowly, so we sometimes find patterns that were released years before mixed in with brand new ones — in this group, two patterns numbered in the 5000’s appear among 6900’s. From left, a girl’s dress and bloomers, Butterick 6923; a “suit” for a young boy, 6928; and another dress and bloomers set for a girl, Butterick 6905, with hat 6323. Delineator, July 1926. Matching or coordinating bloomers were part of a toddler’s outfit. Girl’s dress (probably for 6 to 10 years) No. 6859, and a red bathing suit, Butterick 5210. July 1926. The bathing suit is unchanged from previous summers; it first appeared in 1924. Red and blue often photographed as black, so I love seeing the red swimsuit. It buttons at the shoulders. When I based a painting on this 1920’s photo of my cousins Gerald and Mimi, I made their bathing suits blue, but colors ranging from purple (or navy blue) to red, green, and brown all photographed as black. My cousins enjoying the sprinkler in the 1920’s. I guessed that their swimsuits were blue; now I know they might have been red. At least I gave them red sandals! Three Butterick patterns for girls: Left, 6878; center, 6043; right, 6915. July 1926. Scallops bound with bias tape decorate the front of a woman’s dress and a girl’s dress, both from 1926. Butterick 6915 has colorful dots and a red tie that weaves in and out of openings on the front of the dress. Dresses for school-age girls, Butterick 6959, left, and 6909. July 1926. Like the scalloped lavender dress above, the polka dotted dress (6959) can be tightened at the hip with button tabs. Perhaps the tie on the back of the flowered dress (6909) serves the same function. Butterick 6908 is shown in a large floral print. It has a “saddle shoulder.” Its “collar” becomes a long tie — very common in this period. Butterick 6087 is shown in coral red, trimmed with blue and white smocking. Butterick embroidery design 10365 shows variations on smocking. From the August, 1925 Delineator. Dresses for girls and women were often shown with smocking near the shoulder or hip, and sometimes at the neckline and wrist. In the center, a Misses’ smocked dress pattern, 6012, from May, 1925. Left (6963) and right (6087,) smocked dresses for girls from July 1926. Butterick patterns for little girls: Left, 6963 with hat pattern 6753; right, Dress and bloomers No. 6911 with hat 5557. Illustrated in July 1926. Matching brother-and-sister outfits from July 1926: Butterick boy’s “suit” 6948 and girl’s dress 6958. 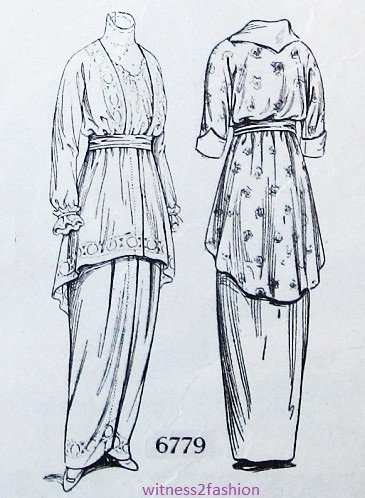 They look like they are wearing blouson jackets; in the twenties, a “dress” pattern could mean a separate top and skirt, often a skirt suspended from the shoulders on a sleeveless bodice. 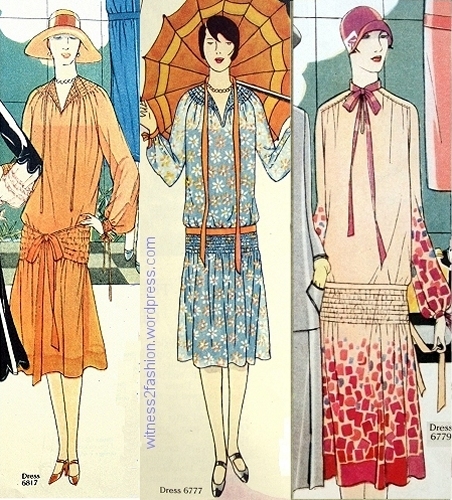 … like this woman’s dress (in yellow) from the same July 1926 issue of Delineator. Left, a bib front dress from June, 1926; right, a bib front dress from July, 1926. Both from Delineator. A caped coat pattern, Butterick 6920, and a top-stitched coat, No. 6955, with Butterick hat pattern 6089. July 1926, Delineator. By making your own hat, you could match it to your dress, as shown at right. The hat on the left, however, has a grown-up buckle trim that must have made its wearer feel very sophisticated. Notice how short these coats for girls are. I sometimes think that young women adapted easily to the shortest of nineteen-twenties fashions because they had never worn longer ones. Below are some coats for young women aged fifteen to twenty from the previous season — March, 1926. Coats for Misses 15 to 20 or small women, Delineator, March 1926, p. 27. Couture by Berthe, left, and Vionnet, right. Delineator, January 1927. Cover of Vogue store flyer, June, 1966. Vogue pattern 6797. These breezy summer fashions are fifty-one years old, but I can’t really remember a summer since then when halter styles were not worn. In 1966, Vogue patterns offered several halter-style dresses, plus a pantsuit with a halter top included. Vogue halter dress patterns 6766 (left) and 6787 (right;) June 1966 flyer. Alternate views of Vogue 6766 and 6787. The only thing that separates these dresses from current styles is that they have more structure: darts, linings, interesting seams — details that we don’t find in garments mass-produced as cheaply as possible, using stretch fabrics and sewing shortcuts. Depending on fabric choice, these two could be very dressy — cocktail dresses rather than casual dresses. Vogue patterns 6793 (left) and 6789, from 1966. The dress on the right has a sixties’ stiffness that requires some lining or flat-lining to hold its shape. The pattern includes a matching jacket. Vogue 6771 included a swim suit whose straps are perfect for wearing under it. Right, the short dress with a flounce, Vogue 6772, also conceals a swim suit. From 1966. Vogue 6772, a beach cover-up with bathing suit included. From 1966. The Commercial Pattern Archive (CoPA) at University of Rhode Island has this pattern, Vogue pantsuit 6795 . It’s illustrated in a Villager-flavored floral print. Although not mentioned in the store flyer, the pattern also includes a skirt and a dress, in day or evening length. A “smock-like” fabric pullover top with matching above-the-knee shorts. Vogue pattern 6727, from 1966. A bit “kookie” is this dress trimmed with ball fringe (optional). Vogue 6726 is a dress with a little Mod/op art influence and some hippie ball fringe…. To see it in color, click here. To the right of 6726 is a much more sophisticated bare-backed dress — I think it has an Emma Peel flavor. In black, Vogue 6751, a side-baring, back-baring “patio dress” from 1966.